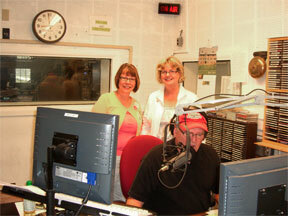 asked Marty Lintvedt and I to co-host last Friday morning. I've never been on the radio live before. There really is a sign that flashes ON AIR in red! The mikes are huge. See the sign in the corner? 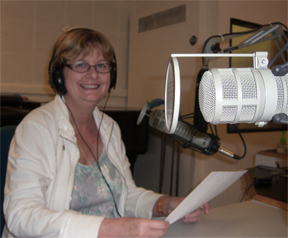 My co-author is a radio natural. 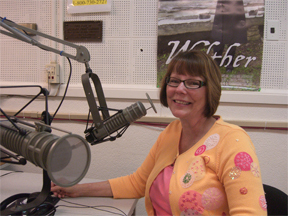 She's been on KFUO on Fridays for several years giving the Friday devotion. Paul asked us questions about We're Not Blended-We're Pureed A survivors guide. He also interviewed my husband Ed, along with us.You can hear that here look for the book cover and click on the mp3 file. LOOK at that mike it's so big! I said that on air. Yep, it's true you can't see radio. Watching Paul Clayton do his job is like watching a well tuned orchestra. He does the news, answers the phones, hurls questions at the co-hosts and can even leave the room for a quick drink of water and make it back to the mike before the 30 second commercial is finished. I however, was afraid to move from my chair--no, I was afraid to move at all! Not sure if I'll ever lose my intimidation over speaking into any size mike! Elaine, the photo was taken at the end of the two hours. So I was free to relax a bit.